Having a disability does not need to keep you from traveling! Currently, the Open Doors non-profit organization estimates that people with disabilities spend approximately 15 billion dollars on travel each year! From a current article in wikihow.com, here are a few travel tips for planning and having the best trip possible! The rise in elderly and disabled population has also increased the number of travelers with disabilities. This has encouraged travel providers to provide more accessible accommodations. The non-profit Open Doors organization estimated that people with disabilities spend approximately $15 billion on travel each year. The United States, the United Kingdom and many other countries provide disability access by law, while other countries do not enforce disability standards. If you plan to travel and you have a disability, it is important to research your destination, travel with all medical devices and medications and ask for assistance ahead of time. This article will tell you how to travel with a disability. 1. Ask a companion to join you on your trip. If you are planning extensive international travel, beware that some airlines do not allow some disabled passengers to travel without a companion. Disabled rights vary from country to country, so a companion can help you navigate new environments and help you in case of emergencies. Consider hiring a travel nurse to accompany you on your trip, if you have serious medical concerns. You can find travel nurse networks online. 2. Book your travel arrangements by phone or in person with a travel agent. In order to receive proper accommodations and access, you must disclose your disability at least 48 hours ahead of time. Internet or email booking does not always include an option to disclose your needs. 3. Research possible destinations ahead of time. Checkout books from the library, such as Lonely Planet travel guides, to get an idea of how accessible the area is. Sites like disabledtravelers.com and independenttraveler.com give advice on the best destinations for disabled travelers. 5. Visit the doctor before you travel. The doctor will be able to tell you if there are any unforeseen travel or medication risks. Request all the medication you require, plus a few days extra in case of delays. 6. Carry emergency and doctor numbers with you at all times. Give a copy to all travel companions, so that they know who to contact in case of emergencies. 7. 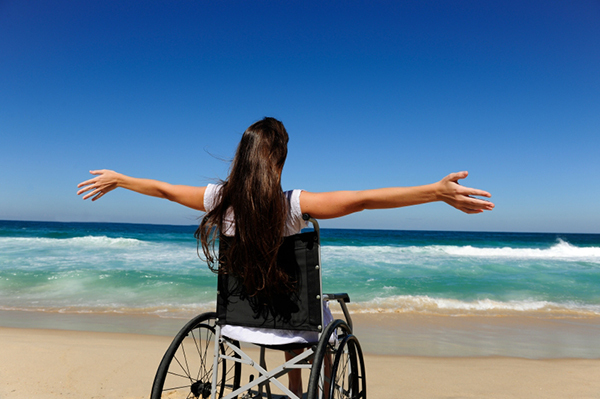 Consider booking a trip with a travel company that caters to people with disabilities. Disabilitytravel.com, access-able.com, armchair.com/tour/hc/handcap, medicaltravel.org and worldonwheelz.com are specialty tour websites. You can choose a tour that is already set up to cater to your needs.